Clouds come in different kinds and altocumulus clouds are one of them. Just like any other type of clouds, altocumulus clouds also come in a variety of patterns and shapes indicating certain weather conditions. To start with, let us first define what an altocumulus cloud is. These clouds are called social clouds because they appear in groups of about 1 kilometer thick. They are distinguished by grayish-white color with some portions darker than the others. The word altocumulus is derived from the Latin words alto, which means middle, and cumulus, which denotes heap. At What Height is Altocumulus Clouds Found? Altocumulus clouds belong to the Mid-level clouds. Clouds in this group appear anywhere between 6,500 feet and 20,000 feet above the ground. Because they are formed at low altitude, this type of clouds is largely composed of water droplets; in some other cases, they can also be made of ice crystals when they appear on higher altitudes. Altoclumulus clouds are further classified into species and varieties. Let’s take a closer look at some of them. This pertains to a certain type of altocumulus cloud that looks like lens. They look very smooth, round, and flat forming beautiful patterns that often amuse photographers and weather watchers. Altocumulus lenticularis occurs due to the effect of waves into the air flow. Normally, it develops during windy days on mountain ranges. As the wave effect pushes the air to ascend above condensation level, the cloud is formed. This type of altocumulus only appears in elevated areas like mountain ranges and looks patchy. In general, the existence of altocumulus lenticularis does not signify any weather disturbance, but it may produce light rain or snow showers when there is ample moisture in the surrounding atmosphere. Altocumulus clouds appear like towers as altocumulus castellanus. They resemble the battlements of medieval castles as a result of the lifting of large mass of air. Mid-atmospheric instability give rise to the formation of air bubbles from its cloud deck and condensation of these air pockets create tower-like projections. Altocumulus castellanus may progress into cumulonimbus storm clouds suggesting possible thunderstorm later in the day. Altocumulus stratiformis pertains to flat and far-reaching horizontal layers of altocumulus clouds. This cloud formation is caused by the rise of moisture content resulting to progressive formation of thickening bands occupying the sky. Altocumulus stratiformis may descend to nimbostratus or altostratus opacus. When altocumulus clouds appear like series of waves or ripples, they are known as altocumulus undulatus. Mid-atmospheric wind shear and instability give rise to its existence. It is a strong indication that there is a large volume of moisture at mid-level clouds suggesting an upcoming light rain or cold frontal system. Altocumulus clouds develop in different ways. Generally, this cloud type grows by convection, the process of rising and falling of air as a result of an advancing frontal system. Its emergence may signify that damp air is rising, combined with descending dry air. Altocumulus cloud may also form in combination with other types of clouds such as cumulonimbus, which is a thunderstorm-producing cloud. Its appearance within cumulonimbus clouds differ depending on the volume of moisture, severity and structure depicted into the thunderstorm. Furthermore, altocumulus can also materialize after anvil develops where it becomes darker with the upcoming rainfall. The amount of rainfall from altocumulus is projected from light to moderate. Altocumulus clouds exhibit some of the features of cumulus clouds which include darker bases and cumuliform tops. 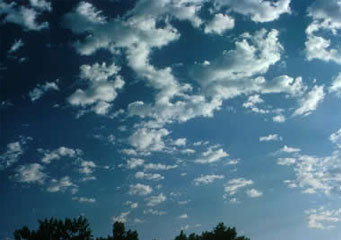 Depending on the weather conditions, altocumulus may be patchy or widespread; rounded rolls or masses. They also differ in appearance and thickness. The advancing of dark altocumulus clouds is sometimes disturbing due to its terrifying appearance. How common are Altocumulus Clouds? Altocumulus clouds occur with other cloud types at lower or higher altitudes depending on the air movement. Normally, they appear between lower stratus clouds and higher cirrus clouds. Altocumulus clouds commonly precede altostratus when warm frontal system is advancing. When altocumulus appears with another cloud type at the same time, storm normally follows. Altocumulus clouds are common in most parts of the world. So, whenever you see altocumulus clouds during a hot sunny day, you can expect thunderstorm later in the afternoon as a result of an advancing frontal system.